You may know that a neodymium magnet is more powerful than something you usually find on a refrigerator, but by how much? Most people, even those willing to harvest magnets from disk drives, accept that some magnets are stronger than others. This, however, wasn’t quite good enough for Anthony Garofalo, who instead converted a prototype voltmeter he made using an Arduino Uno and a tiny OLED screen into something that displays the magnetic, or Gauss level. It also shows whether it’s observing the north or south pole of the magnet, which certainly could be useful in some situations. Though full documentation isn’t available right now, Garofalo says that he’ll make it available once he repackages everything in a smaller format with an enclosure. UPDATE: Garofalo has now completed his design and published a detailed tutorial on Instructables. 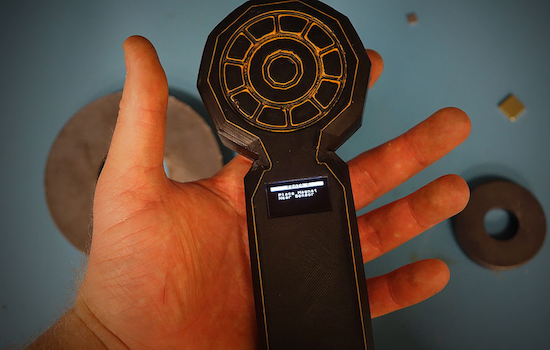 The latest version of his project features an Arduino Nano, along with a pair of hall effect sensors, two reed switches, a LiPo charging circuit, and a 0.96″ OLED module, all housed inside a 3D-printed enclosure that he spray painted matte black. What’s really neat is that the Gauss meter can only be turned on and off by placing a magnet on the center of its faceplate. If you’d like to see more of his work, including the voltmeter he based this off of, be sure to check out his YouTube channel! We require a Gauss meter with the range up to 2 Tesla .Do you provide that? If yes then do you provide the Gauss meter kit?